Electric loco belonging ... to Southern Pacific. This loco #100; ... from Magoons (below Falls at ...) Paper Mills (above Falls). Track ran thru ... of West Lynn [Linn]. Probably in the 1920's. [Stamp]: R.E. Buike - Rail Photos; 1212 S. Ferry, Albany, Ore. [crossed out and handwritten in]: San Francisco. Description Surface roughness. Surface of the paper is torn off a large section on back of photo, so the notes are incomplete. Transcription Electric loco belonging ... to Southern Pacific. This loco #100; ... from Magoons (below Falls at ...) Paper Mills (above Falls). Track ran thru ... of West Lynn [Linn]. Probably in the 1920's. [Stamp]: R.E. 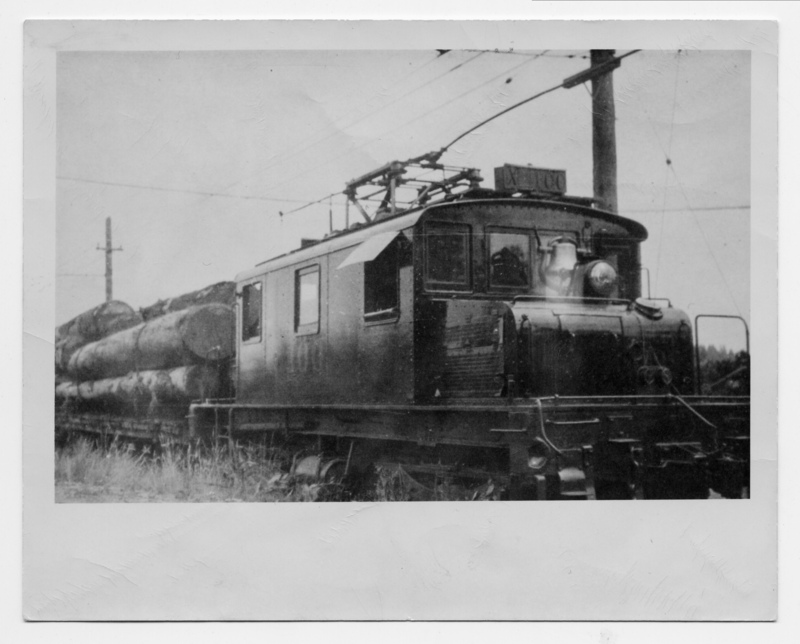 Buike - Rail Photos; 1212 S. Ferry, Albany, Ore. [crossed out and handwritten in]: San Francisco.